This was Tamil Thalaivas first win over Telugu Titans in the Pro Kabaddi League. Tamil Thalaivas produced a solid all-round performance to beat Telugu Titans 27-23 in the southern derby of Pro Kabaddi Season 6 at the The Arena by Transstadia in Ahmedabad on Tuesday. This was Tamil Thalaivas first win over Telugu Titans in the Pro Kabaddi League. Ajay Thakur scored 8 points for Tamil Thalaivas and Manjeet Chhillar chipped in with three crucial tackle points. Rahul Chaudhari scored 8 points but it was Telugu Titans defence that let them down as they scored just seven tackle points in the match. 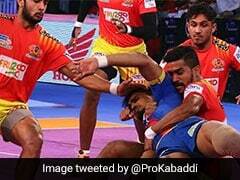 In the other match on Tuesday, Dabang Delhi registered a sensational 29-27 victory over Gujarat Fortunegiants. A last-minute tackle settled what was a really close affair between two evenly-matched teams. Gujarat Fortunegiant's unbeaten run came to an end with this close defeat. It was a team performance by Dabang Delhi as their star players contributed equally. Meraj Sheykh led the scoring charts with seven points and was ably supported by Ravinder Pahal who scored four crucial tackle points. Sachin scored 9 points for Gujarat Fortunegiants and Parvesh Bhainswal got 6 tackle points. In the first match, Sukesh Hegde made a two-point raid in the first minute to give Tamil Thalaivas a 2-0 lead before Rahul squared it up for the Telugu Titans 2-2. After five minutes both teams were tied at 4-4 but a super tackle by Tamil Thalaivas tilted the balance in their favour as they went on a four-point run to lead 8-4. The Titans defence got into the act with two quick tackle points to reduce the lead to 6-8. Ajay Thakur's successful raid in the 15th minute led to an all out on Tamil Thalivas as the Titans led 13-6. Thakur had a strong first half as he scored six raid points. At the end of the first half, the Tamil Thalaivas led 18-10. Coming back, both teams tightened up their defence with tackle points coming thick and fast. After 25 minutes, Tamil Thalaivas led 20-15. A tackle point each in the 28th minute meant that Tamil Thalaivas held a five-point advantage. Titans their 20th point of the match as they trailed 20-25.
hopes for Telugu Titans evaporated. Two points in the last minute weren't enough as Titans eventually lost 23-27.